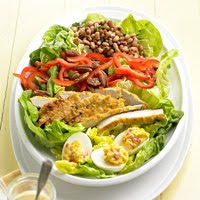 A creamy cheese dressing pulls together crisp fried chicken, black-eyed peas, sweet peppers, and pecans for a satisfying salad. Prepare Pimento Cheese Dressing; set aside. Halve eggs lengthwise and scoop out yolks. In a bowl mash yolks with a fork. Stir in 1 to 2 tablespoons Pimiento Cheese Dressing until smooth. Spoon yolk mixture into egg halves; set aside. Place chicken in heavy-duty plastic bag (do not seal). Pound chicken lightly with meat mallet to even thickness of 1/2 inch. Sprinkle with salt and pepper. In shallow dish, beat together egg,milk, and hot pepper sauce. In another shallow dish, place flour. Dip chicken in egg mixture; dredge in flour. In large skillet heat 2 tablespoons of the oil. Add chicken; cook 6 minutes, turning once, or until golden and chicken is no longer pink (170 degrees F). Drain. Cool chicken slightly; cut in strips. In bowl combine remaining oil, vinegar, and oregano. Add peas; toss to coat. To serve, place lettuce on platter. Arrange chicken, peas, red pepper, pecans, and deviled eggs. Pass remaining Pimiento Cheese Dressing. Makes 6 servings. Let 1 cup finely shredded sharp cheddar cheese stand at room temperature 30 minutes. In bowl beat cheese and 1/2 cup mayonnaise with an electric mixer on medium to combine. Add 1/2 cup milk, one 2-oz. jar drained diced pimientos, 1/8 tsp. each cayenne pepper, salt, and black pepper. Beat to mix. Calories 536, Total Fat 39 g, Saturated Fat 9 g, Monounsaturated Fat 12 g, Polyunsaturated Fat 15 g, Cholesterol 197 mg, Sodium 668 mg, Carbohydrate 22 g, Total Sugar 4 g, Fiber 5 g, Protein 26 g. Daily Values: Vitamin A 0%, Vitamin C 61%, Calcium 23%, Iron 20%. This entry was posted on 2:53 AM and is filed under Salad . You can follow any responses to this entry through the RSS 2.0 feed. You can leave a response, or trackback from your own site.